While steel roofing is a fairly mundane topic, there are still some innovative products that many contractors and homeowners can get excited about. One such cool material I want to introduce is steel shingles and metal tiles manufactured by CertainTeed Matterhorn. They cost on average $7-9 per square foot installed. This includes labor and all materials. 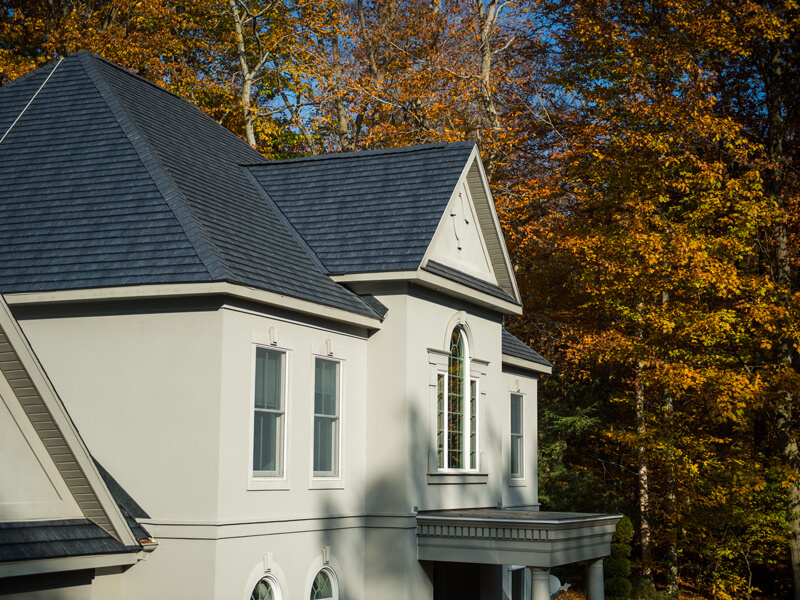 What makes these metal shingles exceptional is their curb appeal: they masterfully replicate natural materials, such as wood shake, slate, and clay tile. Here are their features, design and colors options, pricing and advantages. How much do Matterhorn shingles cost? Because this is a fairly new product, it’s hard to get a very accurate price estimate. Moreover, the company is still in process of building their dealer network. 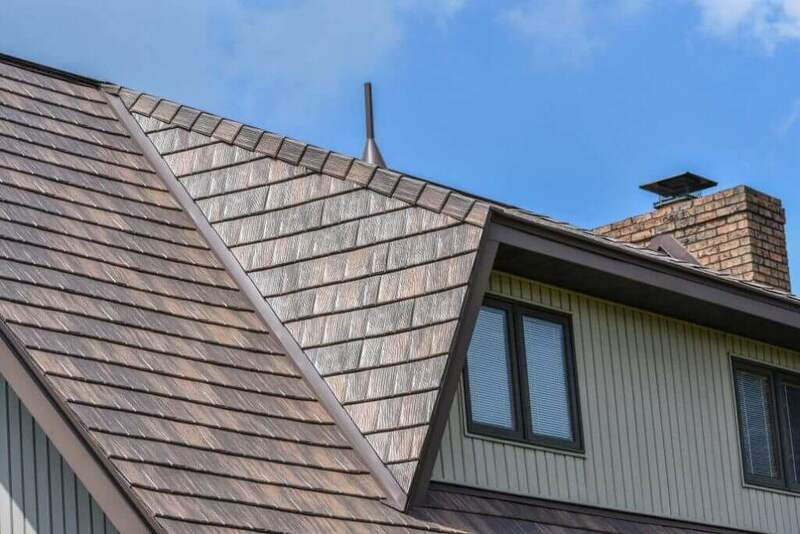 From talking with corporate folks and local distributors, I found out that you would be looking to spend about $5-5.5 per square foot on Matterhorn steel shingles, including accessories and underlayment for a typical gable or hip type roof. Professional installation will be another $2-3.5 per square foot, depending on job complexity. Thus, the total cost will be $7-9 per square foot. For example, a 1,600 sq.ft. 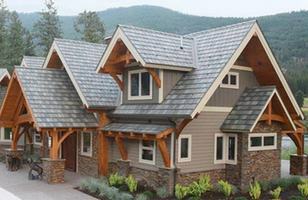 gable roof outfitted with Matterhorn shingles would cost about $11,200 – 14,400 (includes labor and materials). By comparison, I paid about $2.7 per square foot for my Tamko steel roof (includes shingles, underlayment and all accessories). I didn’t need to pay for labor, since I installed them myself. However, I got very plain looking, basic steel shingles. While they are nice, they don’t come close to the sophisticated looks of Matterhorn products. So you need to decide if you are willing to pay extra for curb appeal. I’ve been a big fan of metal shingle roofs for over a decade now – in fact I have been installing them since 2004, and even have one on my own house. 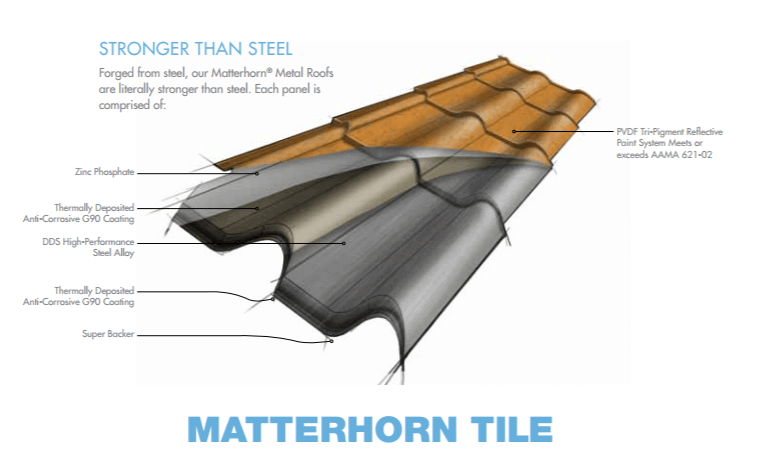 Now these Matterhorn steel shingles are a new kid on the block – I first heard of them about three years ago and they were trying very hard to penetrate the market. In fact the company’s products were so impressive, that Matterhorn has been acquired by CertainTeed, one of the biggest building and roofing products manufacturers. Thus, you can be sure that you are getting a high quality roof, backed up by decades of stellar reputation in the industry. I would say looks is the Number 1 Selling point for these metal shingles. It is incredible just how realistic thy look. They feature a true 3D stamped panel looks like cedar shingles, slate, and clay tile. Even upon close examination, it is hard to tell that you are looking at a steel roof. This makes them ideal for homeowners who like the benefits, but not the the looks of metal. These shingles use a blend of about 5-7 colors (by my estimations) to create this very realistic replica of natural wood and stone. All other multi-tone metal shingles don’t even come close to the level of Matterhorn. My roof is a slate impression shingle by Tamko that is only 1 color – talk about boring 🙂 In my book these shingles are super cool! Moreover, you don’t need to worry about the colors ever fading! Every product is coated with the highest performance Kynar paint coating. It is designed to be fade resistant in all weather, for the lifetime of your roof. Depending on your house architectural style, you can select 1. wood shake; 2. natural slate; 3. clay tile profile. Its important that you carefully consider your preferences, as you are getting a lifetime roof. This means that you should be sure that you will love the way this roof looks even 10 years from now. 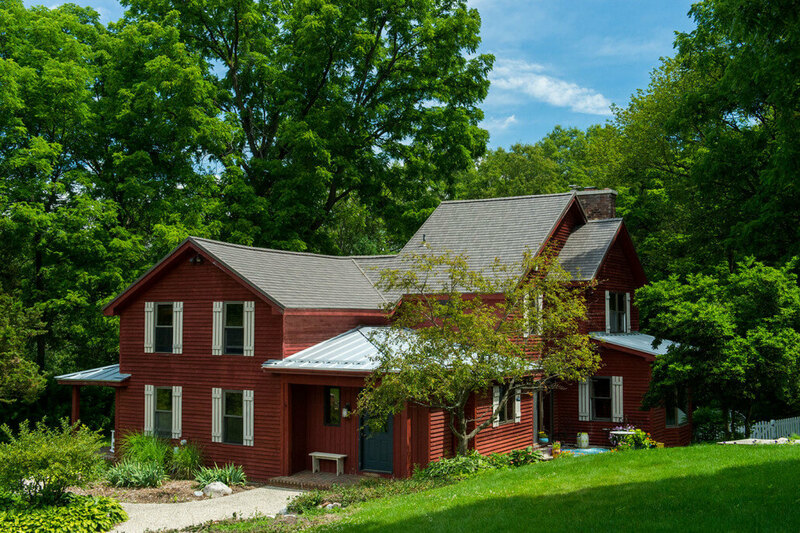 In addition to the beautiful colors, these shingles also replicate the unique and irregular texture of wood, using 8 separate elevation changes within one shingle, as well as special chiseling and embossing techniques. Natural shadow lines, placed where they would be on real wood shakes, complete the realistic look. For owners of high-end homes, who love the look of natural stone, there is metal slate profile. Each panel includes eight different elevation changes that replicate the irregularities found in real slate. Moreover, there are multiple crack lines that further enhance this organic look. You can choose from the following 5 beautiful colors: 1.Storm Slate; 2. Mountain Sage; 3. Cobalt; 4. Castle Grey; 5. Brownstone. These are designed to replicate the color variations found in various types of slate, from dark charcoal to red, green, and brown hues. If you have a Mediterranean Style home, metal tiles that look like real clay is an ideal fit for your roof. One of the biggest advantages of installing metal is that it is much lighter weight than clay tile. In fact, many roof and home structures cannot support the heavy weight of a real clay roof without additional reinforcements. These cost thousands of dollars and created added pressure to your house structure. Metal tile solves this issue, and it can be installed on any home with a proper roof pitch. This roof only weighs 108 lb per square. It is lighter than many of the asphalt shingles brands! For example, a typical CertainTeed shingles roof weighs 250 lb per square. In many cases it can be installed directly over existing shingles, which can save you money on tear-off. If you are interested in doing this type of install, its important to consult with your roofer to make sure this will not compromise the integrity of the new system. You can choose from a selection of 8 beautiful colors, that can match both modern and traditional style homes. Note, that all colors are Energy Star Rated, which means that this is a cool roof coating that will provide significant energy savings. Wind uplift resistance: independently tested and shown to have wind resistance of up to 130 MPH. This is equivalent to an F2 tornado. By comparison, most asphalt shingles have uplift resistance between 110-120 MPH. Snow and ice: designed to withstand the harshest winter conditions and prevent ice dams. Metal is the ONLY roofing system that can effectively ensure that ice dams will not form and damage your roof and house. Hail: features the highest possible Hail Resistance Rating – Class 4. This means that even the strongest, wind driven hail will not damage your roof. By comparison, most other materials are not designed to stand up to hail. They will sustain severe damages that will most likely warrant roof replacement. Fire: holds the highest possible fire rating – Class A. This means that even if there is a severe fire outbreak, your roof will not catch on fire. Like most other steel roofs, these are made of corrosion resistant G-90 galvanized steel. It is rust and corrosion resistant. It is also not susceptible to warping, rotting and termite infestation, like real wood shake. It will not break, crack or become brittle, unlike real clay tile or slate. Every roof is coated with a special PVDF Tri-Pigment Reflective paint system. It is designed to re-emit up to 89% of absorbed solar heat. This will keep the surface of your roof cool during the hot summer months, and will prevent excess heat from entering inside the home. As a result, you will not need to run the AC as much and will be saving both money and energy. This roof would be ideal in regions such as Texas, Florida, Arizona, etc that get heat and strong sun year round. In these areas, having a cool roof can save you up to 30% off your annual electricity costs. If you are concerned with the environmental foot print of your building projects, you will be pleased with the fact that all Matterhorn shingles and tiles are 100% recyclable. Moreover, they are manufactured partially using recycled metal. This is very different from asphalt roofs, which for the most part need to go into our crowded landfills. As with any product, Matterhorn roofs do have a few disadvantages worth noting. First, I am not a big fan of their flashing components. I mean they work and all, but not what I like to see in a metal roof. Second, since this is a rather new product, there are very few contractors who are capable of doing a good job installing it. If you are interested, you should contact the manufacturer to ask for a list of installers they would recommend. You can find a local metal roofing contractor here. Moreover, price is a huge negative for many homeowners weighing the pros and cons of asphalt vs metal roofs. There is really no reason to pay so much for a metal roof, unless you are really sold on its looks. Other manufacturers make high quality steel shingles that will work just as well. Lastly, this brand is still difficult to purchase in many regions in the US, due to lack of proper distribution in place. 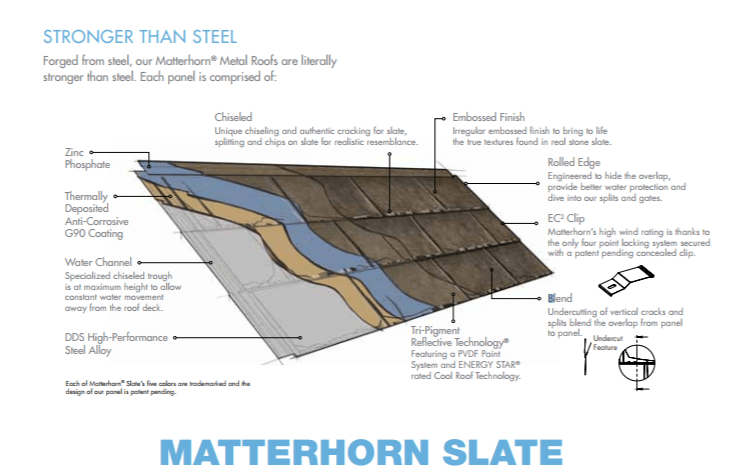 CertainTeed Matterhorn is by no means the only metal shingles available for residential building. In fact, they are considered a luxury metal roof, positioned at the higher end of the price spectrum, when compared to other metal roofs, especially steel ones. Moreover, if they are not available in your region, there are other metal products of similar quality that can work for your roof. The most economical steel shingles that offer great value and long lasting service are manufactured by Tamko. While they may not boast the fancy color technology, they are a solid metal roof and can be the best option if you are trying to switch from asphalt roofing to metal, and do it on a budget. Other great quality metal roofing shingles are manufactured by EDCO (available in Shake and Slate profiles) and Classic Metal Roofs. Both of these companies price their shingles somewhere in the middle of the road between Matterhorn and Tamko. So if you are looking for better curb appeal, and a price that will not break your bank, these products are a good option. 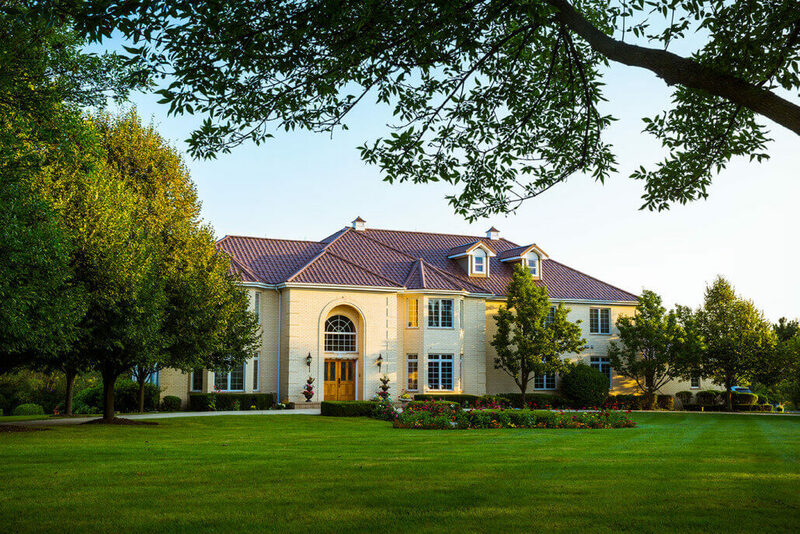 There is also Decra Roofing, which is famous for its stone coated steel shingles and tiles. However, these are rather expensive, and cost about the same as Matterhorn: $4.5-5 per square foot for materials. They are a good fit for someone looking to install a metal roof that looks like a completely different material (asphalt, clay, concrete). One of the biggest advantages of going for a metal roof is the great return on investment it offers. Because it will not need to be replaced like asphalt roofing, prospective homeowners will see it as a huge benefit. No one likes to deal with roof leaks, and money draining repairs. A “forever roof” like metal offers the peace of mind that your home will always be protected. 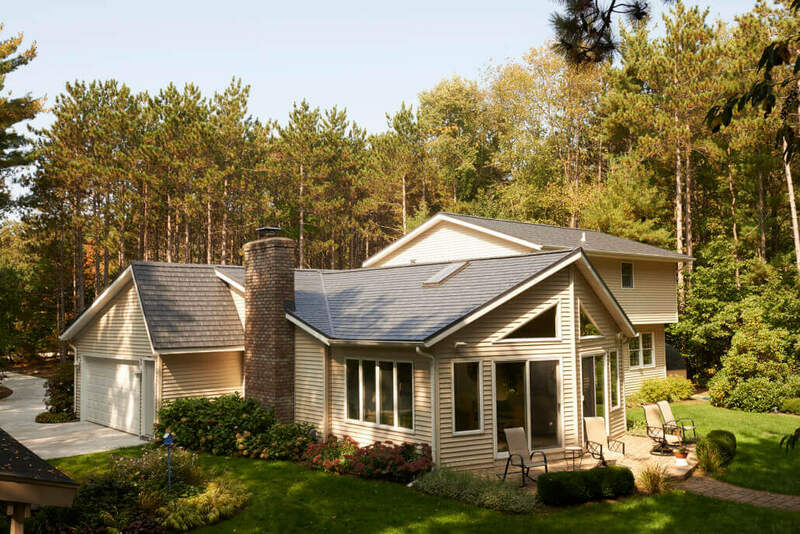 A typical house outfitted with a metal roof can sell for as much as 5-7% more than the same house outfitted with an asphalt shingles roof, even if its a high-end, expensive shingle. Especially in the snow country states, homeowners know the real value of a durable roof that can shed snow and ice. The average ROI in these states after sale is as high as 95%. The national average resale value is also very high, its around 85-87%, which is considered one of the best returns in the building and remodeling industry. Why can’t professionals be direct and to the point? I read this whole article looking for the cost. 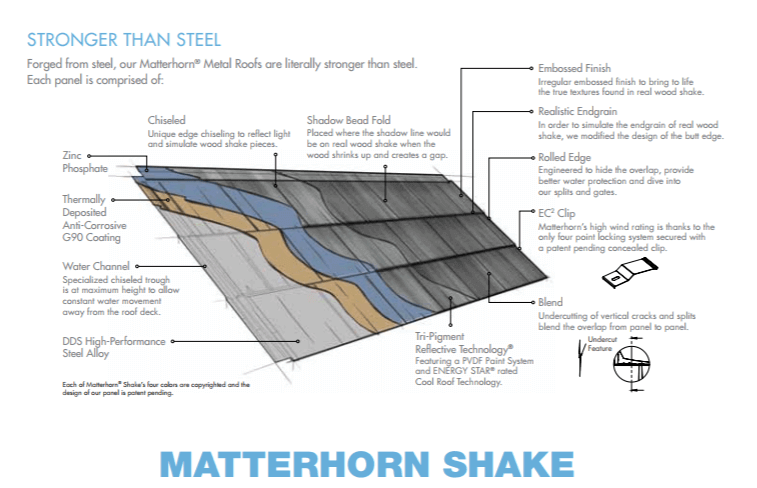 Then I get to the cost of a metal Matterhorn roof… and guess what? For the life of me I can’t understand the authors cost statements? Very frustrating! Author states 5 $ a square FOOT, for a typical roof , all accessory’s and underlayment. I’m going o go out in a limb and conclude this IS for a METAL Matterhorn roof? Installed complete. 5$ a foot or dare I talk “squares”- 500$ per square. Install, all materials ?? Then other follows up with, “not cool” comment and states – he paid 270$ a square for his roof. Now I’m further confused and further frustrated! First off, why in heavens name explain cost in two different denominations! Sq. Foot and a “square”. Next, I’m left wondering? His 270 $ a square cost was for what ? A different brand metal roof than Matterhorn? Is 279$ a square price including install , accessories and underlayment? The typical metal roof is 500$ a square , with accessories and underlay. If that includes install- that’s anybodies guess?? Just don’t understand a thing this guy says about metal roof costs statements. 270$ a square for WHAT ?? Materials ? Underlay? Install ?